Over the years there have been many cartoons featuring characters with incredible speed - Road Runner, Speedy Gonzales, Speed Racer and more. As kids, these characters showed us that being really fast is cool. But in reality, we know that speed must be combined with quality. Have you ever agonized over picking cabinets for your kitchen? Many types of wood, stain and paint colors, hardware choices and millwork designs can make it difficult to decide. 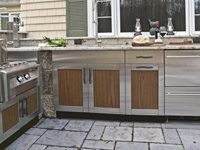 When it comes to outdoor kitchens, many homeowners steer clear of cabinetry all together because of durability issues and limited options. In this day and age we like instant gratification. We can look up information almost instantly on our mobile phones, we order food from restaurants that promise to have it ready in less than 3 minutes, we stream movies to our TVs at the click of a remote. We wouldn't typically lump a construction project into this category. Most of us expect construction work to take weeks, if not months. Do you remember the feeling of being a kid in a candy store? 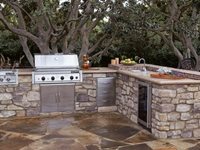 Shopping for a grill can feel the same with feature after feature enticing you to buy. Here's a grill that combines simplicity with quality. Are you still using that old portable grill? You know the kind meant for camping? Don't you think you're ready for an upgrade? Wouldn't a grill that's large enough to cook for more than three people at a time be nice? What about one that grills, sears, roasts and smokes? What about one that allows for precision temperature control? 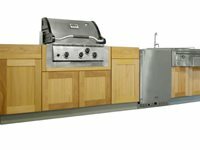 Discover how you can satisfy the whole family's taste buds with a hybrid grill from Kalamazoo Outdoor Gourmet. See how a unique drawer system makes it possible to cook with any combination of charcoal, wood and gas. 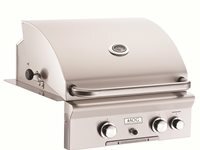 Discover how easy this grill is to light and how quickly you can have charcoal ready for cooking. Plus see how the cast iron griddle, grill and wok attachment can be used to grill, stir fry and more. 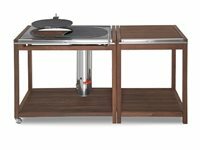 Evo grills make outdoor cooking a shared experience. The circular, flat top grill, which is open on all sides, allows guests to easily gather round and enjoy the company of the cook. 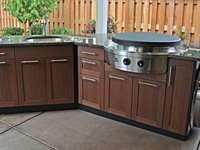 They also offer nearly limitless cooking possibilities, allowing cooks to do things that aren't possible with an open flame grill. 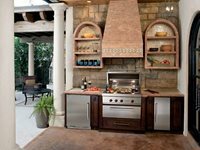 Some homeowners are opting for an Evo grill in place of a more traditional open flame grill, while others are using it as an accessory appliance. 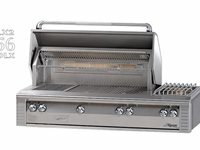 This grill, manufactured by Alfresco, is both attractive and highly functional. 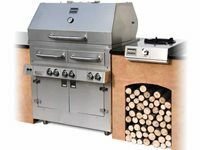 Complete with three high-temp burners, an integrated rotisserie, smoker drawer and an attached dual side burner this grill will meet the needs of the avid outdoor chef. An optional infrared sear zone can also be included to lock in juice and flavor.